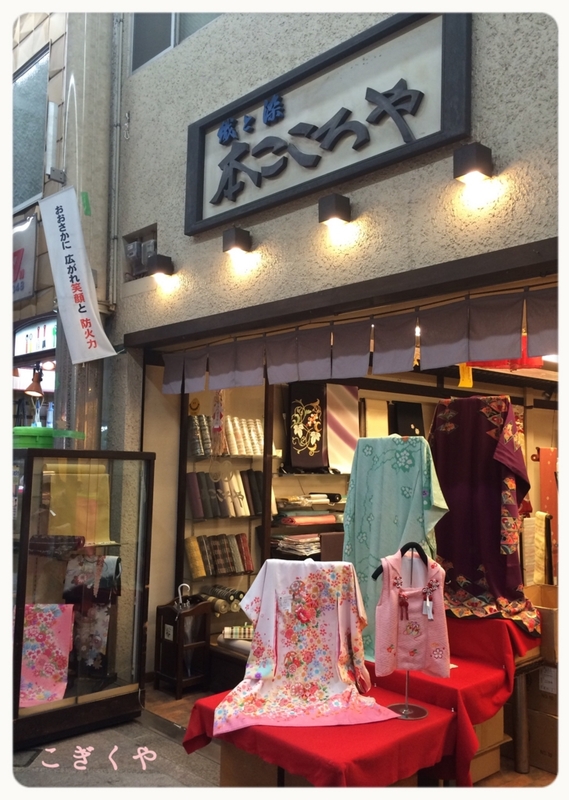 Do you know any good places to find your favorite Kimonos? 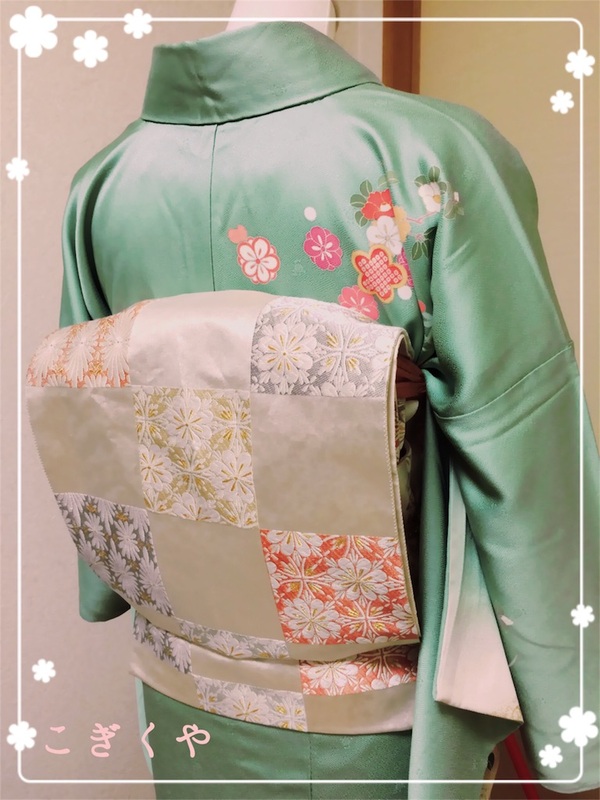 Here's the right place for all Kimono lovers!! Enjoy shopping and find your right ones! First and foremost, I'd like to express my sincere sympathy to the people affected by this disaster in Kyushu. 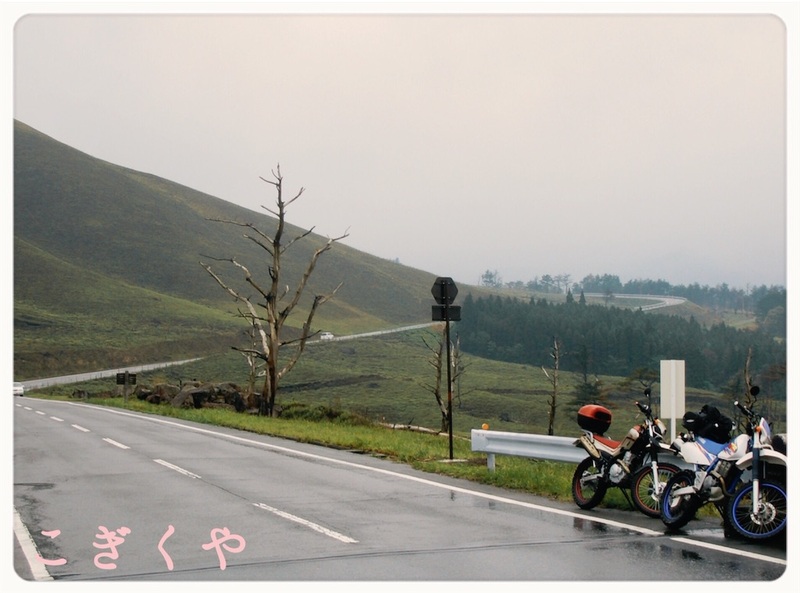 My husband and I have visited Oita and Kumamoto on a motorcycle ride about 10 years ago. The mountains were beautiful and we enjoyed their spectacular scenery all along the way. Since then we always wanted to visit there again some other day. Photo from 10 years ago. The completely different sceneries can be hardly recognized. Wishing all the residents will be able to return to their normal lives as soon as possible, even a day earlier. Other than praying, I am going to do what I can do for them, and do my daily tasks as well. Talking of my daily tasks, one of those is making everyday meals, and today's topic is, Daily meal to cheer you up! Last Friday, my husband, who is the most reliable and strong person to me in the world, got a sudden attack of kidney stones and came back from work much earlier in agony. He looked so unusual, totally different, was just like a helpless child at that time. The stone was about 5mm big and somewhere in between his kidney and urinary duct. His doctor said, there's no way other than waiting for the stone go out by itself. Some painkillers made him feel better but still it would take a while before stone go away. So what I did is to cook dishes which helps the stone find it's way out without fail and eases his stressed out body and an anxiety from pain. Rice gruel with edible adlays and lotus nuts. Salad of onions, cucumbers and corns. Garland chrysanthemum and dailily in sesame sauce. Adlays and corns drain excessive water from your body. Dailily and cucumber bring the fever down. Lotus nuts and jasmine tea ease your feelings. Edible adlays make your skin very smooth, dailies increase the blood, and garland chrysanthemums are just the same as medicine which take care of your lungs, skins and stomach! The menu of this night turned out to be a good ones not only to my husband but also to me! 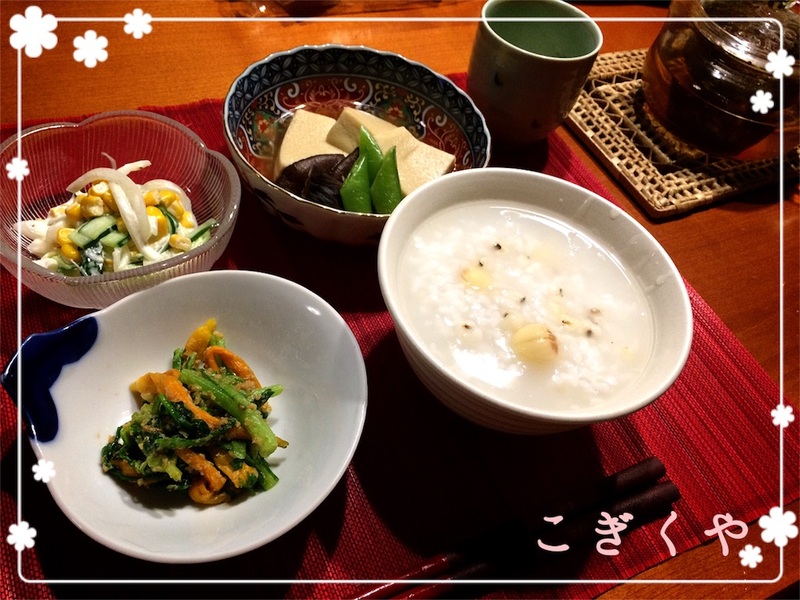 There are many other food which eases feelings than lotus nuts, if you feel uncomfortable or fear to see the disaster over in Kyushu, please try some. Maybe jasmine tea is good and easy to start with. If only I could cook those dishes for the victims of the earthquakes. 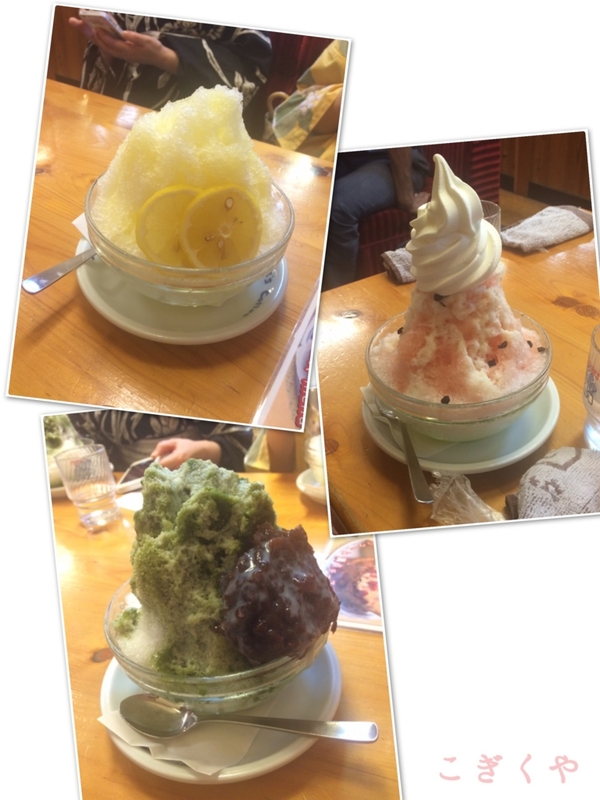 I believe hot and nice, well planned for good health meals can make people happy and smile. I do hope this little wish is fulfilled soon. Thanks for coming back here. 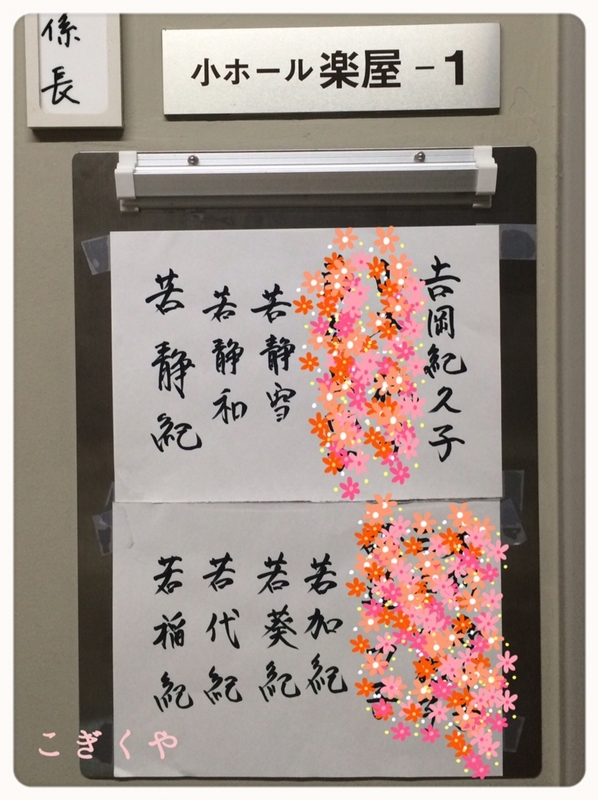 I'm glad there're many inquiries about dressing service for ceremonies of graduation and entrance, and fortunately did some services actually. Some of my clients gave me feedbacks and allowed me to share those here. Ms.T, who was going to attend her son 's senior high graduation ceremony in March, applied to the service. 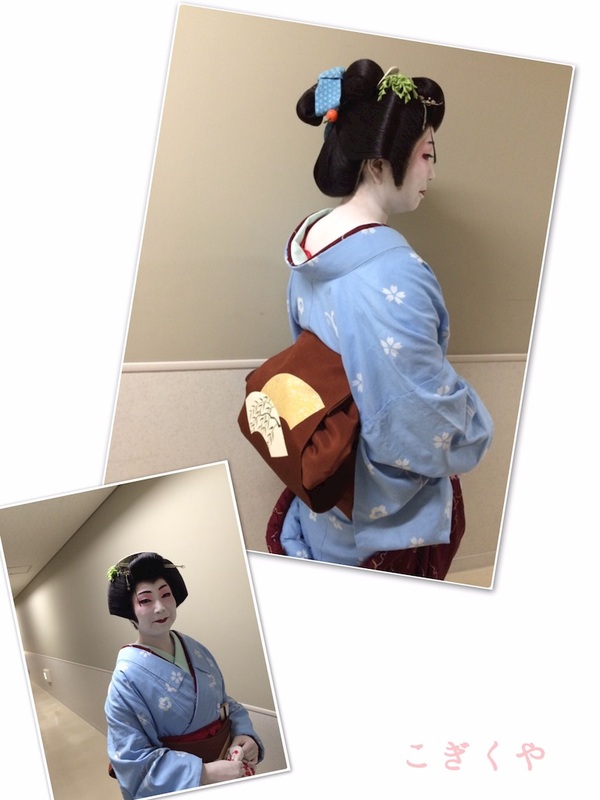 She says wearing Kimono was so much comfortable than she used to think. 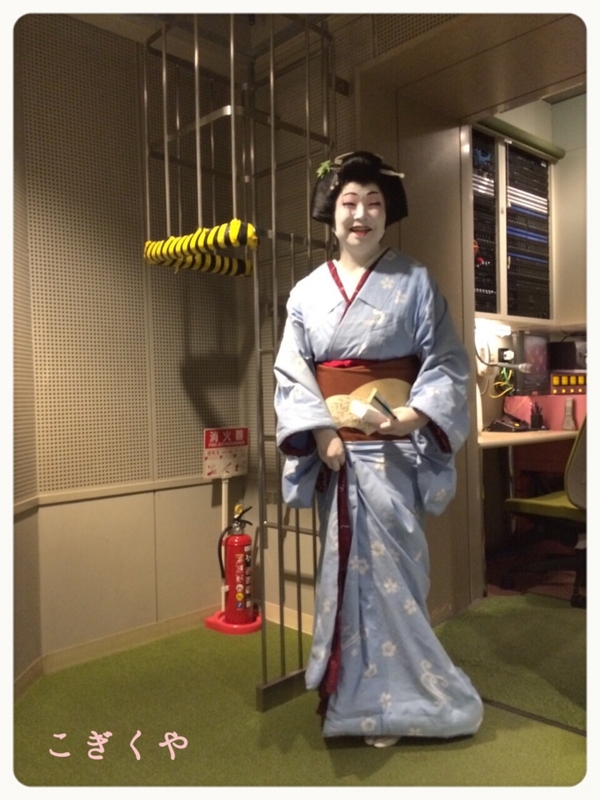 After the ceremony she went out for a dinner in kimono, which doesn't bother her at all. I'm so excited to hear it! Yay!! Even better news is, she applied for our basic class after that! 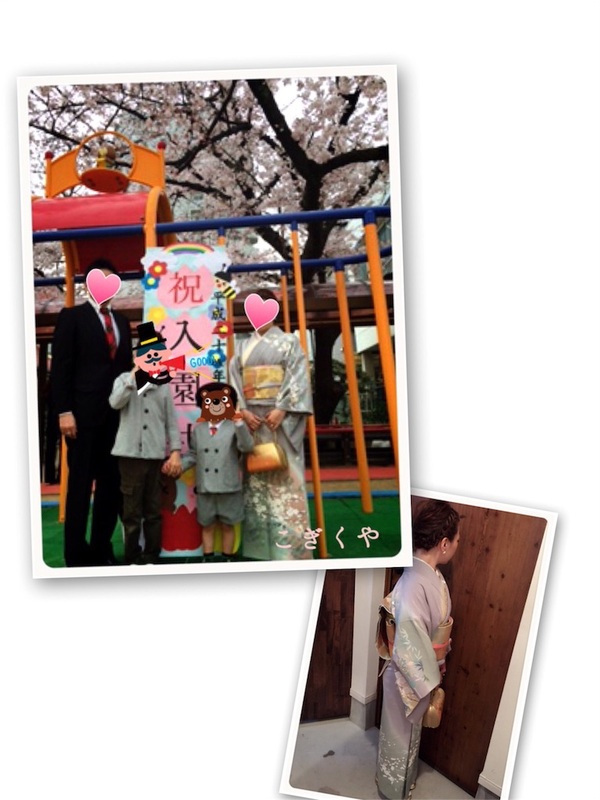 In April, we had Ms H, who was going to attend to her youngest son's first entertaining ceremony in kindergarten. She sent me nice photos and allows me to share here. 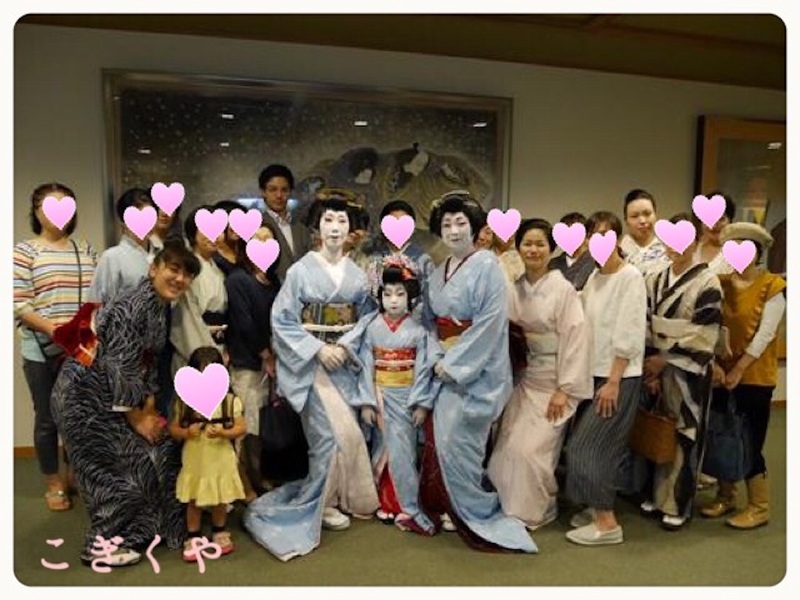 Ms H herself is so cute and tender color kimono really looked good on her. Look at those kids! They were so adorable and I couldn't stop smiling while they were hanging around while I was dressing their mom. Congratulations to both of you and all the freshmen. Wishing you the best all through your life from now on. Thank you again for giving me chances to be of any help for you. For more informations, please visit our website or send us a message to the address below. It was really a big day for me. 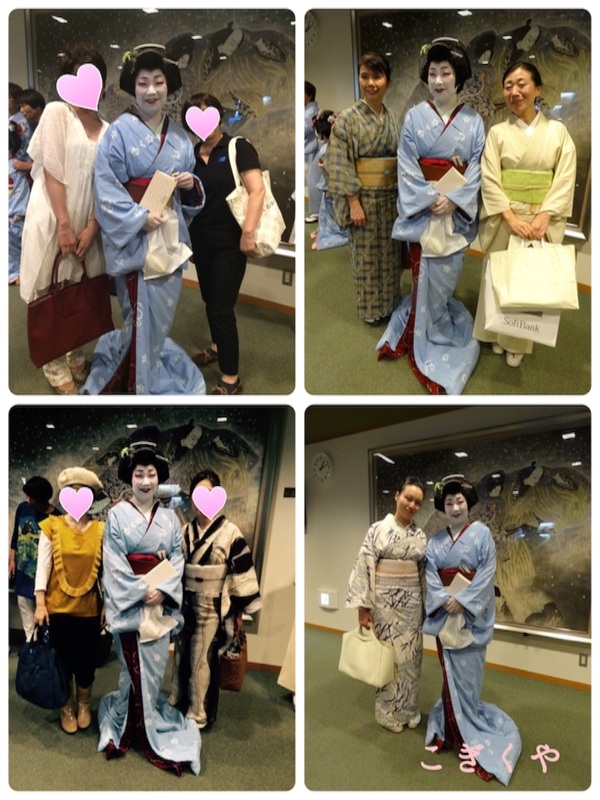 On August 30th, Summer recital of Kamigata-Mai (Japanese traditional dance) produced by Great Master YAMAMURA Wakasaki was held and successfully over. As I mentioned in an earlier post, I made a debut as a dancer. Thank you for coming all the way to see our performance despite the rain. We were very greatful to have such a large audience there. Let me give you a glimpse of backstage though some photos. Most of them were took by my friends and they allowed me to use those photos here. Thank you for your kind words! Oh, I'm still excited and I can't believe a week has past already since that day. Arrived at the theater at 9 o'clock in the morning. I got thrilled to see the name card tacked on the wall in front of the dressingroom! 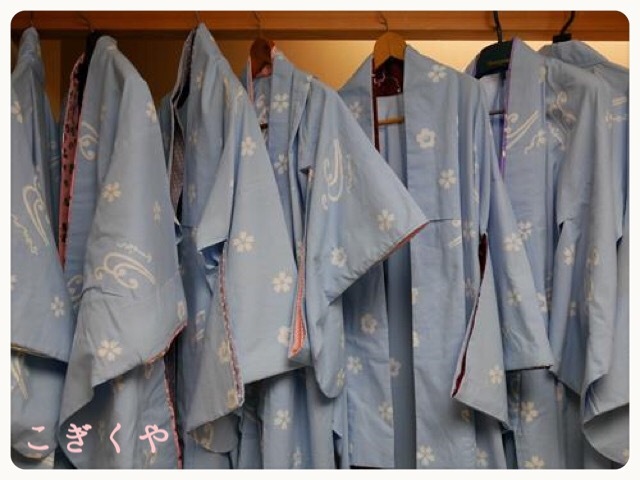 Soon after entering the room, everyone took their stage out-fit(kimonos, as a matter of course) out of suitcases and hanged those up real quick before they got wrincles. We all use the same cotton fabric on outer. 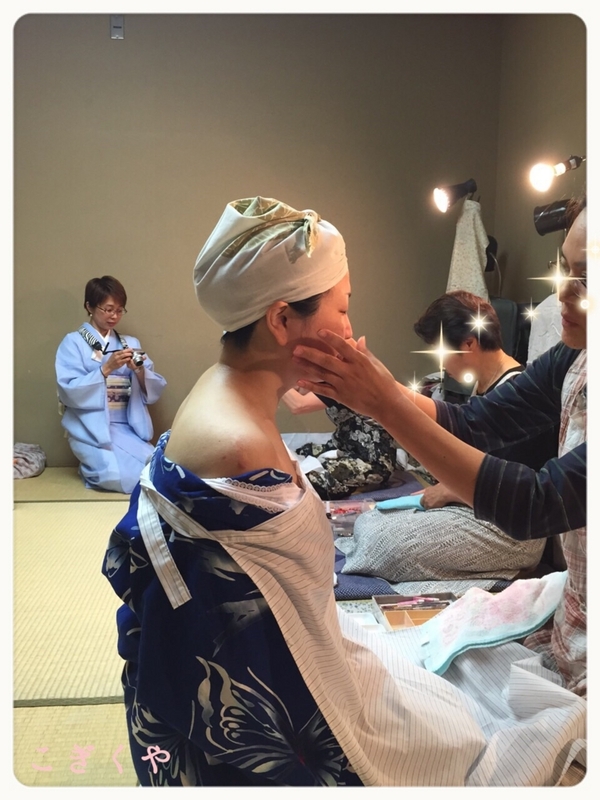 Then, changed into a Yukata (as a dressing gown, in this case) and visited makeup artists' room. As a makeup base, they used a very hard solidified oil. 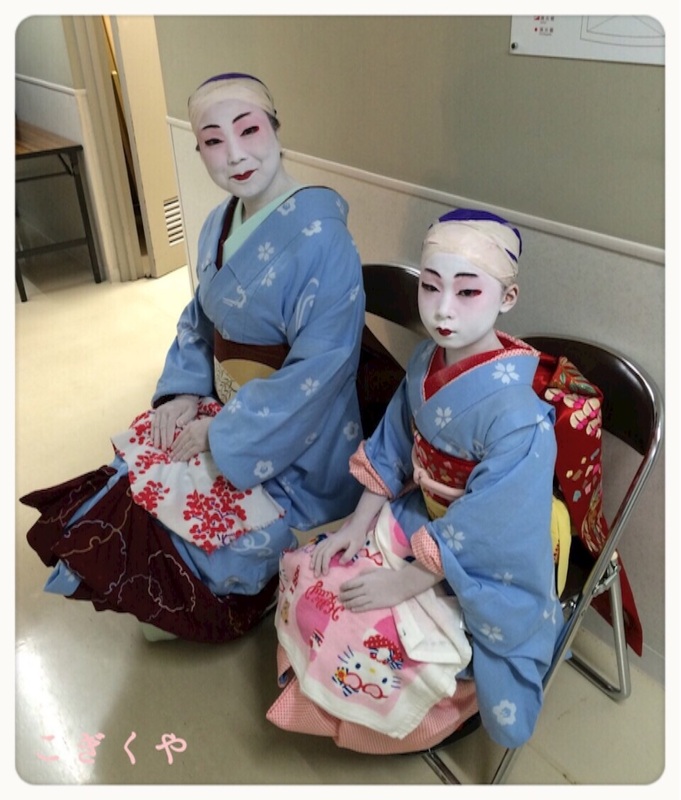 They mix white powder with water and applied it with wide brushes. Painted not only my face but my back in white too. You can see my arms are whitened too. They left both hands unpainted till the end, when dressing was done. 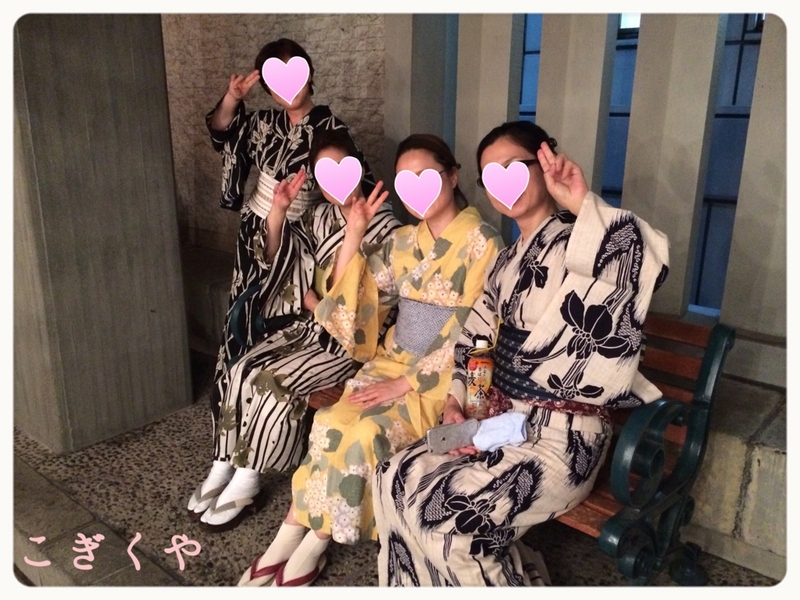 Then, wear the stage Kimono! Costume dressing is a male profession. 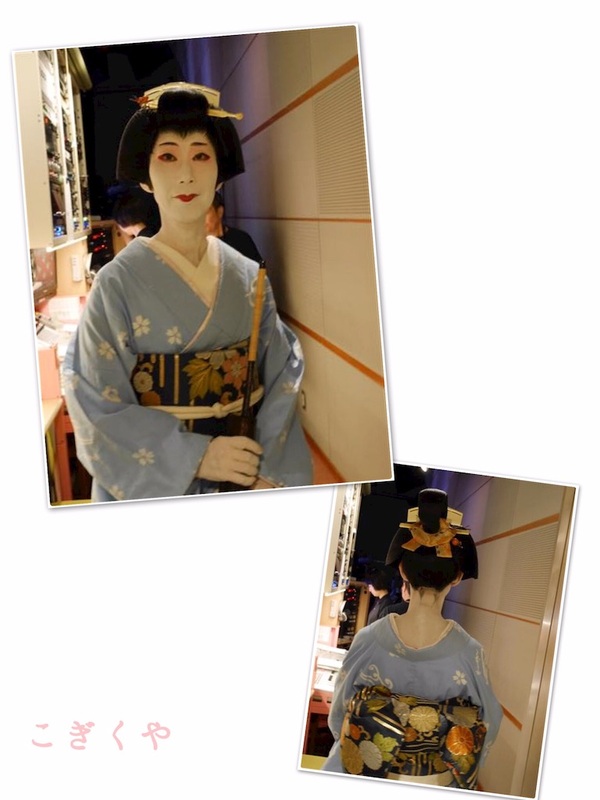 It requires power and strength to dress a stage Kimono and tie a long and stiff Obi to dancers. I was trying hard not to laugh nor even smile. If you laugh when you have white makeup on, you will get a crack on your face and the white powder will fall off soon. Never laugh in white makeup! 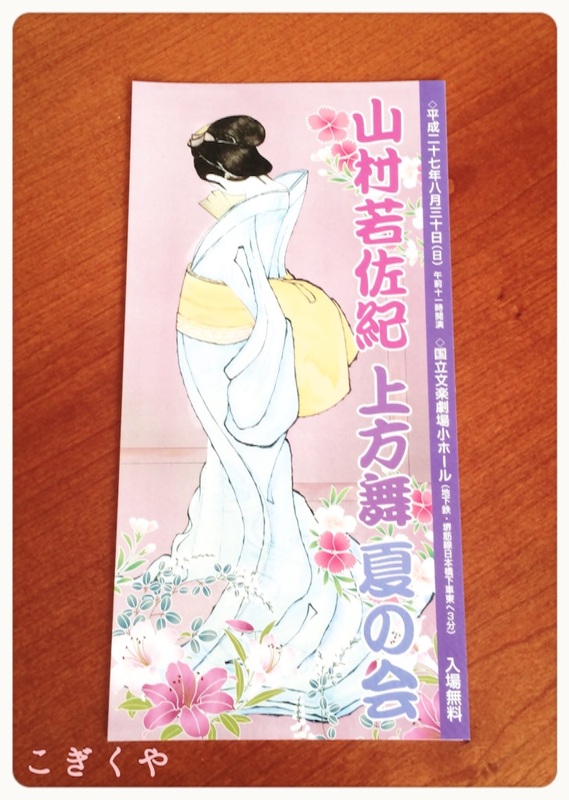 The hair style, accessories, Obi, inner collar, everything gose well and match with my dance program, "Kishi-no-Yanagi"(willows on a bank) which describes early summer scenery in old-time Tokyo. Here's 7 year old pretty girl! She will be a spirit of wisteria flower. This is her first stage. Same as me! Now we are ready for the stage! Unfortunately taking photos of performance is prohibited for the audience and I don't have any to share now. I'm sorry for this. The music began and the curtain rose. I took the first two steps towards the middle of the stage. I could hardly see what laid ahead, no audience in my sight. I was blinded by the strong spotlight. It was only the stage floor there. I could listene to the music and start my dance. While dancing, I remembered my teacher, master Wakashizuki's voice giving me advices. Don't look down, straighten your arm here, never shake your head, and so on. Anyhow, I could finish my performance without major troubles and the curtain dropped. Went into a lobby and showed our deep appreciation to the audience. We were all satisfied and proud of ourselves. Thank you so much for your warm support always. Together with our troupe members and friends. Some of them came from Tokyo! We were so glad such many people come see us and send us their hearty cheers. 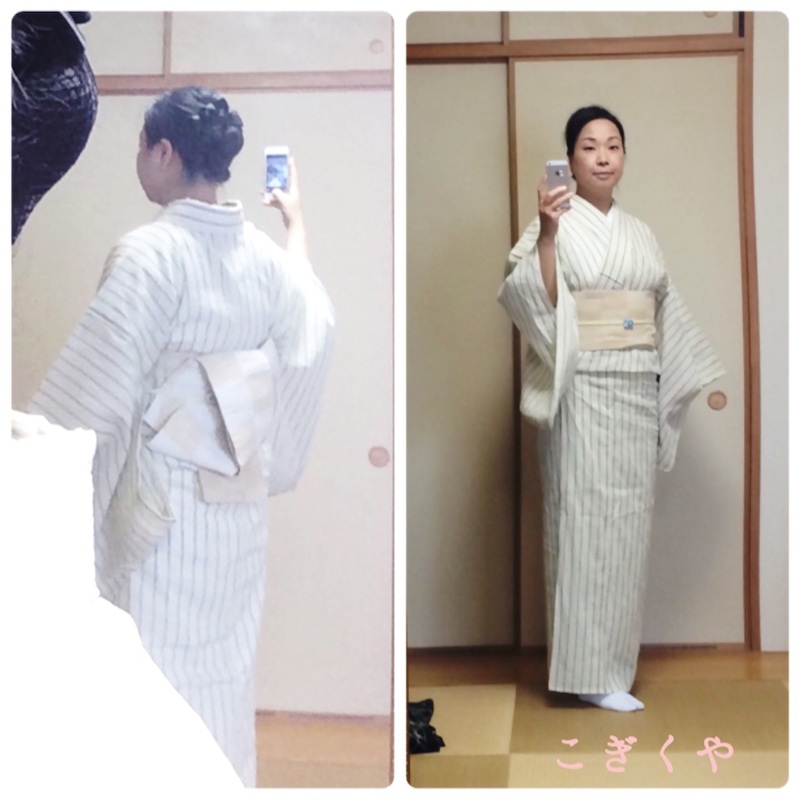 If you are interested in Kimonos, please visit our website! Bon dance for a change! We sometimes need to take a break while concentrating in something. For me, Bon dance is a just right rest. I know too much rest may prevent my usual practice, and so, narrow down the target to a few Bon dance parties to join. 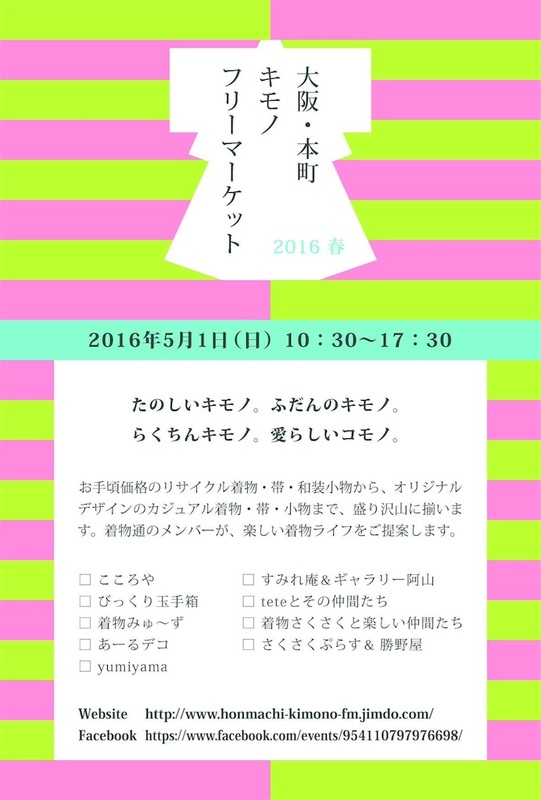 This is the one I really love to join, Bon dance festival at Kita-Mido. They have a changing room and a cloak, so you don't have to worry about your baggage! 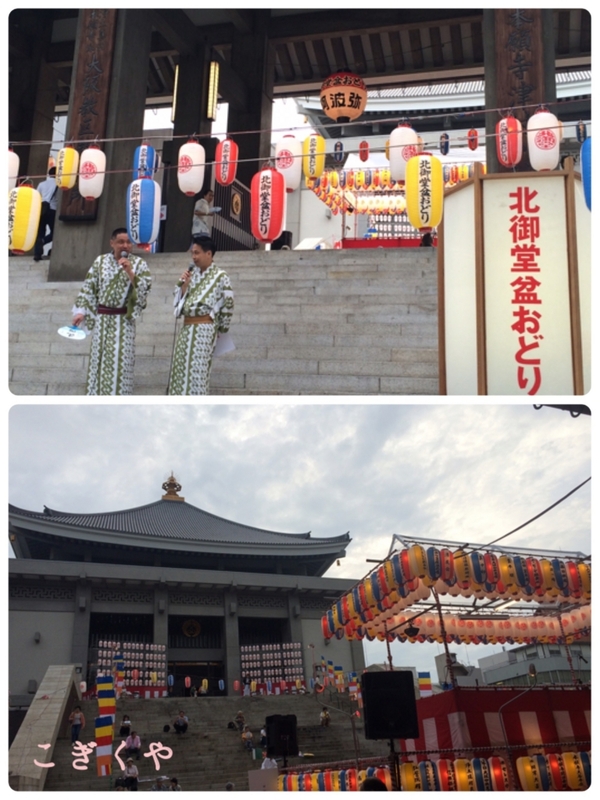 Two Rakugo storytellers, Mr. Yuhei Shofukutei and Mr. Emimaru Hayashiya started a warm-up talk to catch people walking by. To those two storytellers' eyes, all people in suits appear as elite buisinessmen and women appears as beautiful ladies. 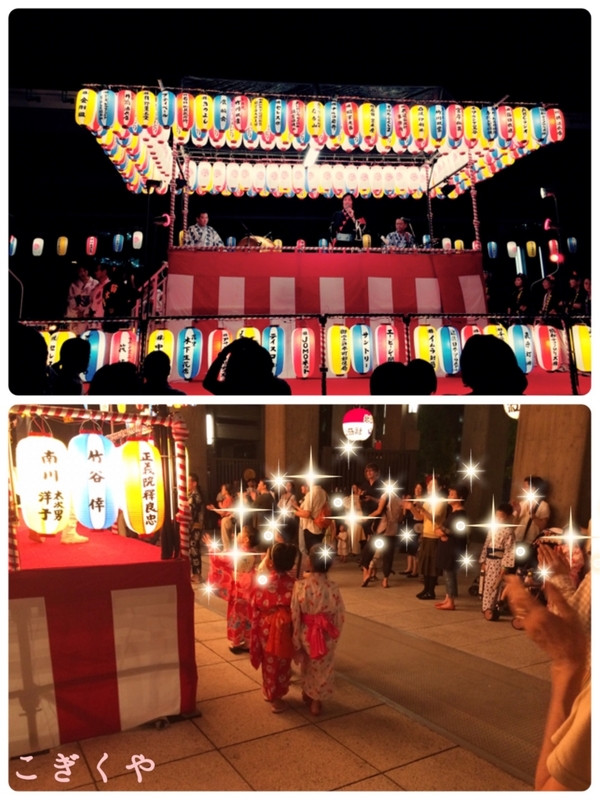 Until Bon dance begins, there are some fun events like marble scooping, chance lottery and etc...During those events, the said two storytellers pump up the mood with their talk. Waiting for the madness of Bon dance. How adorable! 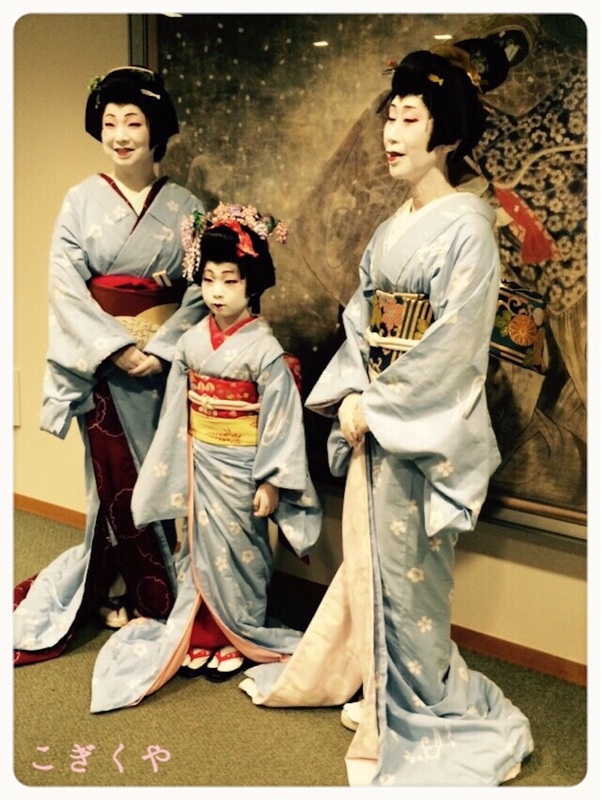 Cute little girls in lovery yukatas. We were all stirred up into a frenzy by awesome voice of Kawachi Ondo(dance song) singer, Mr. Kikusuimaru Kawachiya at once! With my Bon dance friends who stick it out to the end. 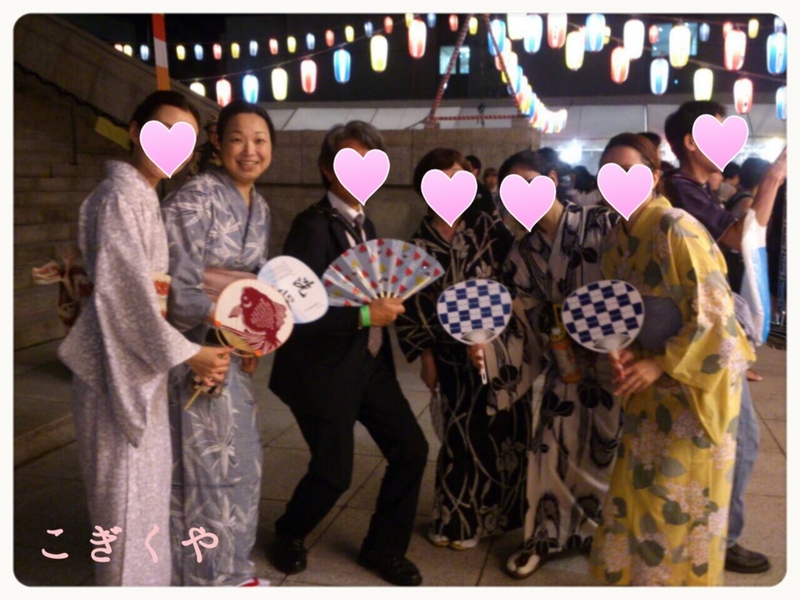 The man in a black suit is a Bon dance master. He knows 7 different choreographies! So impressed! 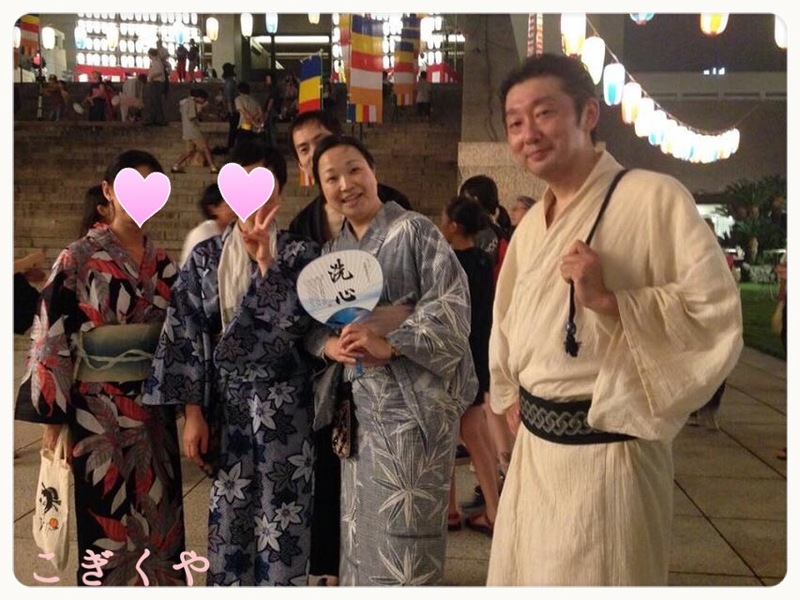 With Mr. Tamanosuke Horaiya, Anzuya cafe owner, M-san & M-san. Now that woke to reality, and we need a cooling down. I don't eat nor drink something cold usually, but I needed an ice on this day. What a delightful day it was! 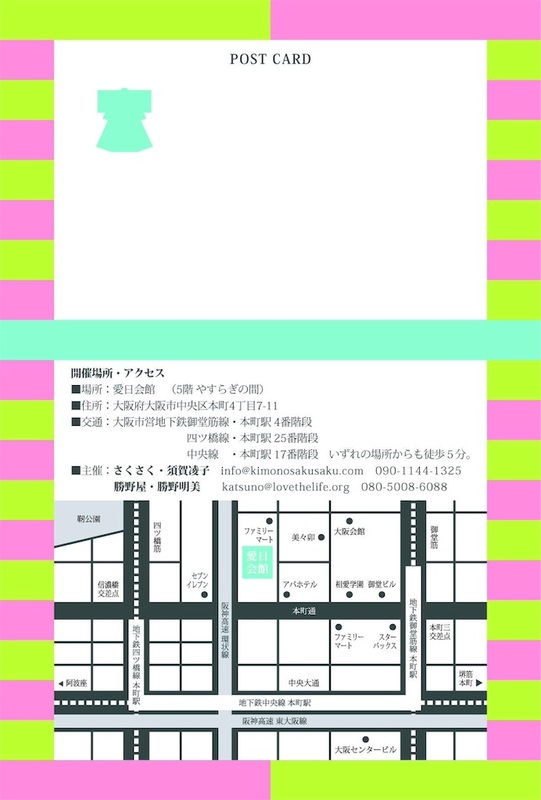 There are other Bon dance festivals coming in Minami-mido on Aug. 27&28, in Nakanoshima on Aug. 28. Enjoy Bon dance! It's already August 22nd today! That means there's only 8 days left till my first stage. Or, I should say, there are 8 more days left for me. 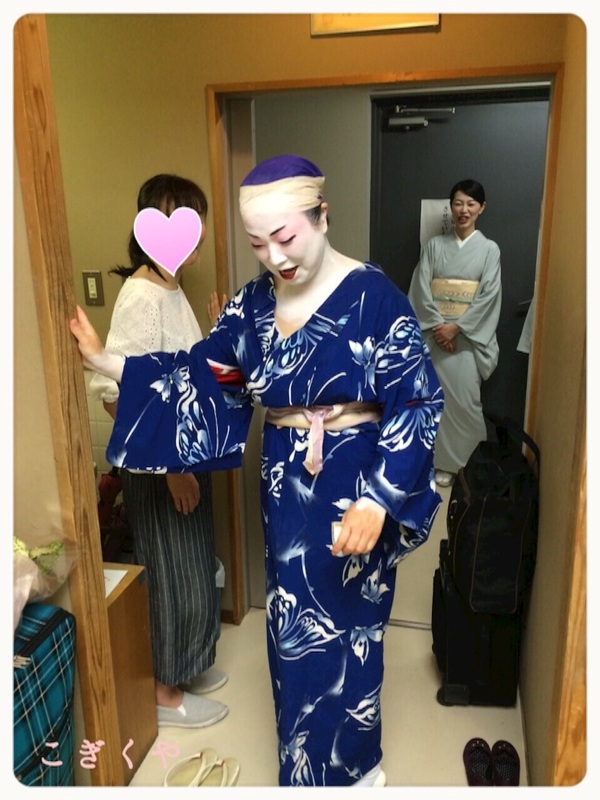 I will make the debut as a Japanese traditional dancer on August 30th. It's waiting just around the corner and all I can do is practice ! Other than practice, one thing I should do before the day is to get special accessories and underwear for the stage. 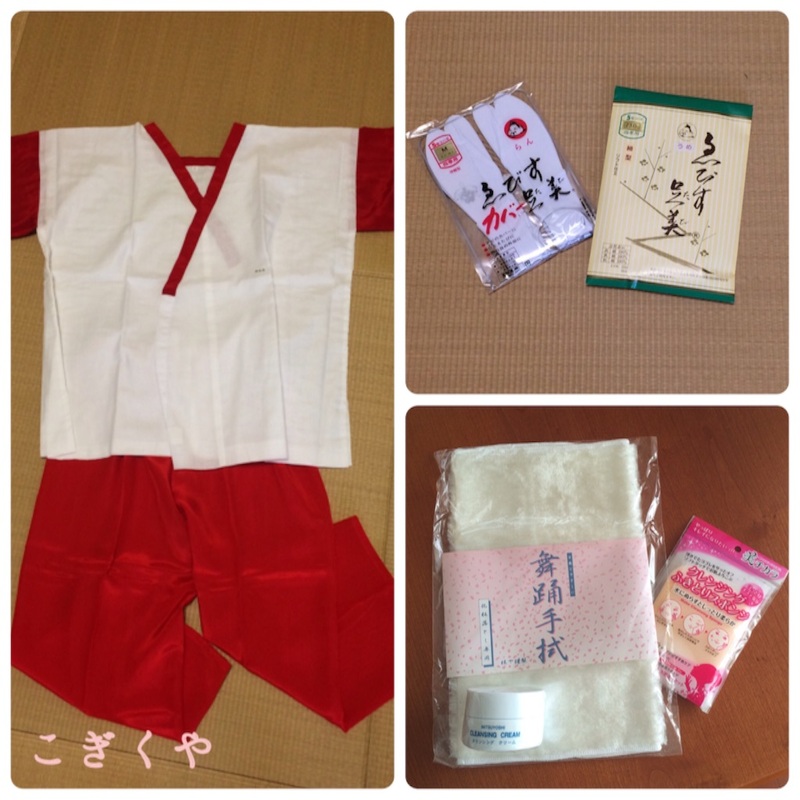 Left...special underwear for the special Kimono for stages. Lower right...Special cloth and cleansing cream to remove thick and heavy makeup. What I wore on this day. Thank goodness, there are 8 more days! 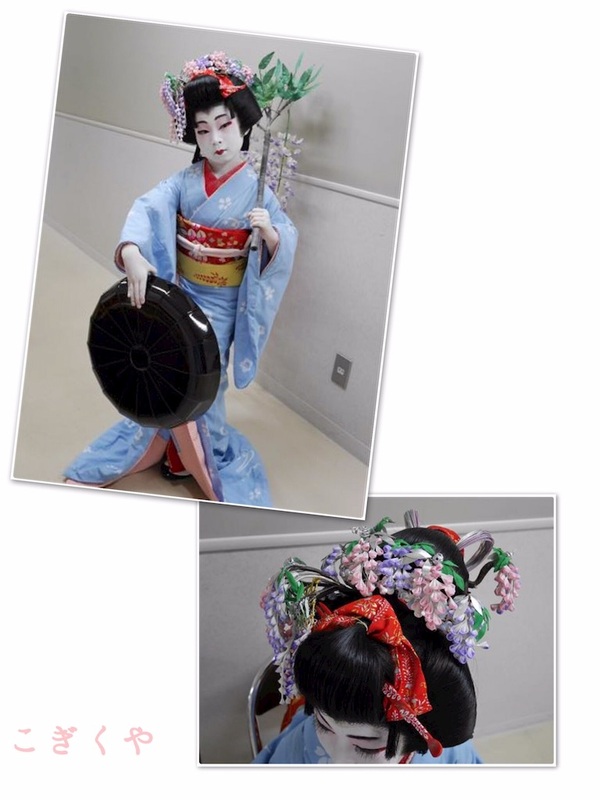 National Bunraku theater, small hall, on August 30th.